Many people think spelling consists of memorizing all the words in a dictionary and that spelling comes naturally to some and not to others. This is a misconception. Good spellers aren't born, they are taught! 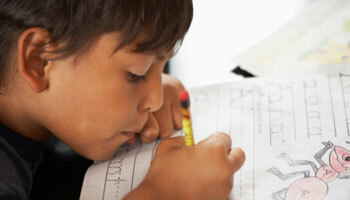 Nearly 90 percent of English words can be spelled if a student knows basic patterns, principles and rules of spelling. If a child can spell a word, he or she can usually read the word. In fact, there is a strong relationship between spelling and word reading, because many of the same abilities — phonemic awareness, knowledge of letter patterns, an understanding of morphology and word meanings — underlie both reading and spelling. Good spellers make for better readers and writers. Dr. Louisa Moats, an expert in literacy instruction, says that spelling is a visible record of a child's language processing, and gives us a window into what a child understands about word structure, and speech sounds., and how we use letters to represent those sounds. Looking at a child's spelling is a wonderful diagnostic tool. There are about 400,000 words in a dictionary. In about 50% of the words, sound and letter associations map simply and perfectly. These words don't have to be memorized. Another 37% are easily learned through instruction of slightly more complex letter-sound correspondences. Only 13% of English language words are truly exceptional, in that they must be memorized by sight. Alphabetic principle: Knowledge of which individual letters match up to sounds, in a left to right sequence (In the word cup each sound is represented by a single letter). Pattern information: Which groups of letters function as a pattern to represent sounds. Examples of patterns would include: CVC (Consonant/Vowel/Consonant) pattern to form short vowels (e.g. like the word cat) or CVCe/CVVC patterns to form long vowels (e.g. like the words same or meat). Spelling variations based on word origins (e.g., ‘ch’ sounds like /ch/ in Anglo-Saxon words like check, /sh/ in French words like niche, and /k/ in Greek words like chaos). Meaning (morphological or morphemic) information: Which groups of letters represent meaning (The prefix re- as in redo, means to do again). Instruction should include Greek combining forms and Latin roots. Adapted from: Bear, D.R., M.A. Invernizzi, S. Templeton, F. Johnston (1996) Words Their Way: Word Study for Phonics, Vocabulary and Spelling Instruction. The Johnson School in Charlottesville, VA, has its own homegrown reading program called RISE (Reading Initiative for Student Excellence).